The gun is extremely cool. 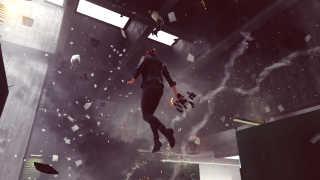 Control is a game about freaky supernatural events and telekinetic powers, set inside a mysterious and austere facility where things are going very wrong. I played about half an hour of Control at last week's Game Developers' Conference, and I'll admit that the brief taste of combat I had didn't grab me. In a presentation before the demo, Remedy talked big game about its new savvy enemy AI, but I felt like I was mostly going up against generic videogame enemies I've fought a thousand times before. I used Force-like powers to throw benches and chunks of concrete at them, floated around in the air, and slammed into the ground with a shockwave. I wanted to love those powers, but I didn't, at least in the short amount of time I played. Maybe the problem was that the combat encounters themselves weren't interesting—there's no sense of progression in a short demo, and I was just floating around blasting bad guys with furniture with no cause and no stakes. I was ambivalent about being a Jedi in a leather jacket. But the gun was a different story. Control has only one gun, but that one gun is actually many guns. The service weapon morphs between different forms as pieces of metal float around its core and reconfigure, bound together by sci-fi magic. It is a totally non-essential animation that conveys Remedy's attention to detail. There's a ton of creativity poured into this single object. I was reminded of Vanquish's similarly sweet gun animations, but Control's gun animations feel even more alive. A perfect condensed representation of the game's aesthetic. I love the 'wings' that flank the shaft of the gun here, and how they're jolted outwards when you fire in this powerful magnum-like form. This mode, Pierce, takes a couple seconds to charge up but can blow straight through concrete or multiple enemies. The way the shards spread further and further from the core as you hold down the rapid-fire trigger convey so much about your rate of fire and ammo count. This one's from a video in which Remedy's designers talk about making the gun. Last year Remedy posted a closer look on Youtube, though the gun model looks like it's probably unfinished here. But that animation still looks so cool. You'll be able to augment the gun with power-ups that affect stats like damage, firing and reload speed, and so on, and you can have two forms equipped to switch between at any given time. Control is out on August 27, at which time I will promptly ignore its story and psychic powers to play around with its gun transformations.